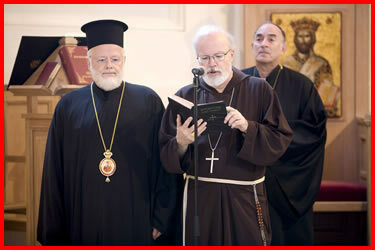 I am currently leading, together with Metropolitan Methodios of the Greek Orthodox Metropolis of Boston, a joint pilgrimage to Rome, Constantinople and Saint Petersburg. 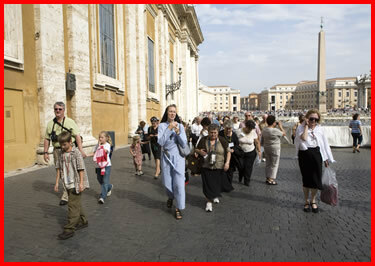 My blog gives me the opportunity to share the pilgrimage with Catholics from Boston and beyond who were unable to accompany us. 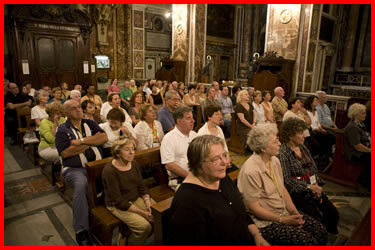 Before I left on the trip, we had a wonderful assembly of our clergy last Friday. About 450 were able to be with us. 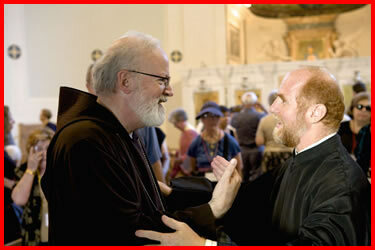 It was a time to pray and reflect together over our experiences as a diocese in the last few years. Bishop Robert Hennessey gave a very beautiful talk to open the meeting, which I think set the tone. Then there were group discussions, a presentation regarding the well-being of our priests, and I gave the closing address. 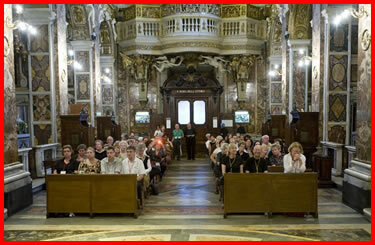 We ended with a dinner and had a beautiful vespers service. 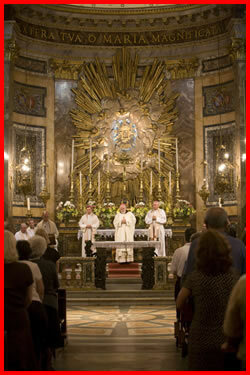 Our priests worked very hard at preparing the day, and all that work paid off. The event was an opportunity for us to come together and try to begin to prepare for the challenges ahead as we embark on our bicentennial — a new century in the life of the church of Boston. I think in general the reaction to the day was very positive, and I think everyone found it was a way in which we were able to deepen our commitment to the Lord and to one another in His ministry. 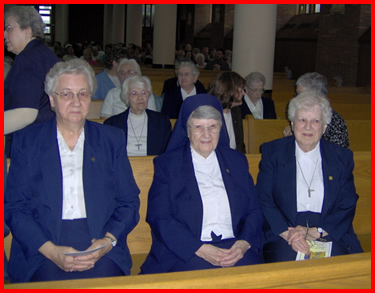 We will have another assembly in November, which will be a spiritual meeting in preparation for the evangelization program that is going to be a part of the celebration of the 200th anniversary of the archdiocese. 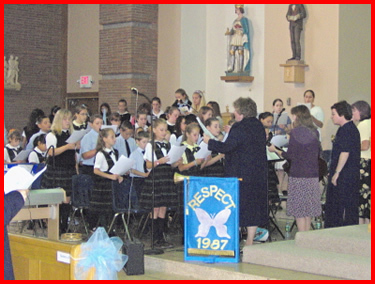 A couple of weeks ago, Sept. 9, I celebrated the Mass for the Centennial of St. Louis de France School in Lowell. Although children come from different parishes in the area, the school is officially associated with St. Marguerite d’Youville parish in Dracut and the pastor Father Robert Connors is very supportive of the school. 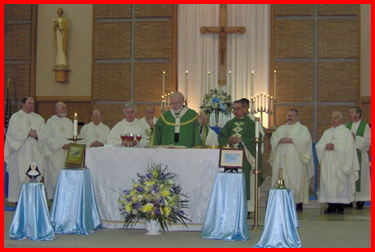 Celebrating Mass at the school gymnasium. 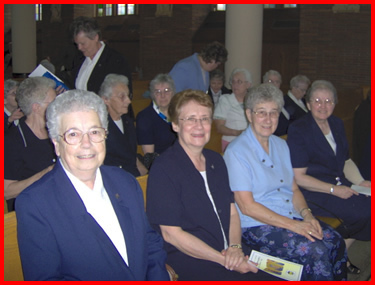 The School has been staffed by the Sisters of the Assumption of Nicolet since its founding and there are still many sisters in the local community and six working full time in the school. 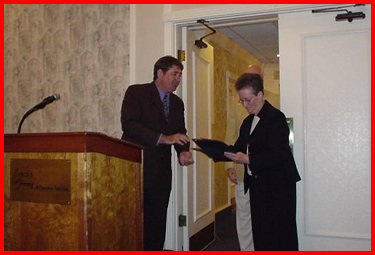 Sr. Irene Martineau, the school principal is doing a very good job managing the school. The school was originally founded to meet the needs of the local French Canadian immigrant families — who worked mostly in the local mills — and now serves a wide range of immigrant populations from many countries. The pilgrimage left Boston on Sunday evening. 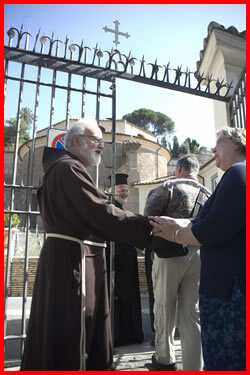 Pilgrims spent Monday settling into our accommodations in Rome. 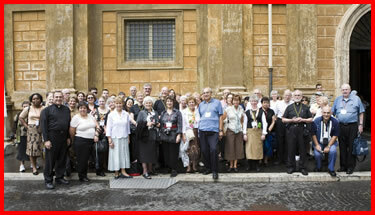 Here in Rome our presence is greeted very enthusiastically. 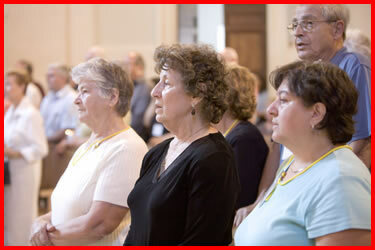 People see this as a wonderful initiative and an important way of bringing our people together in a very practical way to have them pray together, be pilgrims together and learn more about each others’ Church. It’s a wonderful experience. 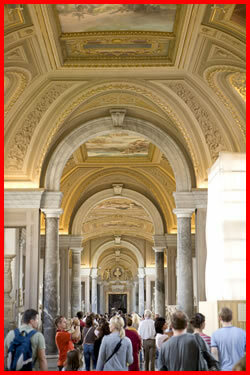 On Tuesday, the pilgrims spent the day visiting the Vatican. 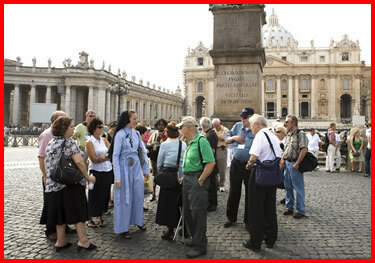 In the morning, they went on what we call the “scavi” tour. 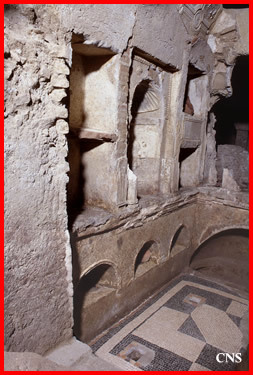 They visited the excavations of a necropolis underneath the basilica where St. Peter is actually buried. It is always a very moving experience. 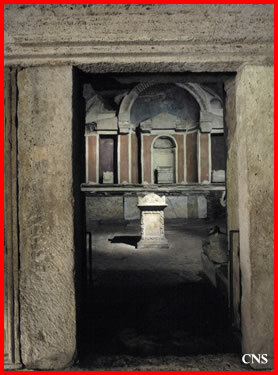 Photos are not allowed inside, but I thought you would like to take a glimpse of the necropolis, so I am posting a few photos of the site from Catholic News Service. 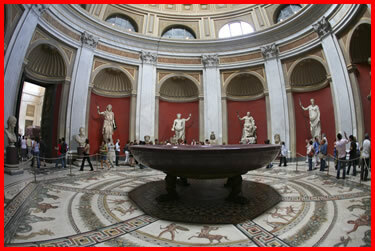 the tombs of rich families, middle-class families and even some slaves. 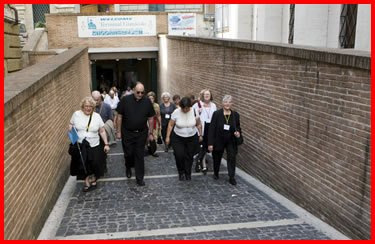 There are narrow passageways leading down there and groups can only go down 10 at a time. 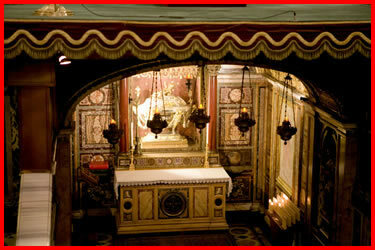 But visiting St. Peter’s tomb really is, to me, one of the most spiritually uplifting things about visiting. 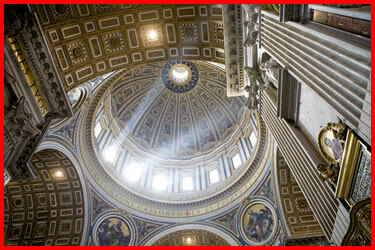 Peter is the rock on which the Church is built and on which St. Peter’s Basilica is built literally because his tomb is directly under the high altar of the basilica. 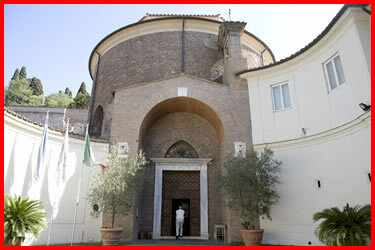 For the Orthodox as well as the Catholics, visiting the tomb of St. Peter the Apostle is a very meaningful spiritual event. 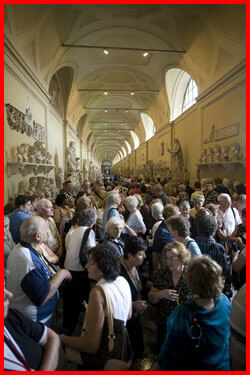 The pilgrims also visited the Vatican Museums that include the Sistine Chapel. 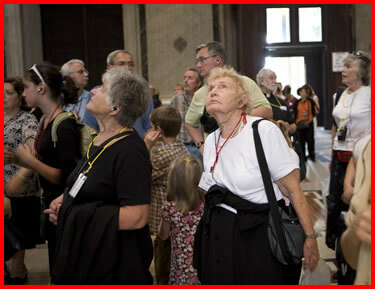 Sister Mary Christa Nutt, of the Sisters of Mercy of Alma, Michigan, very graciously gave a tour of the basilica to the Boston pilgrims. 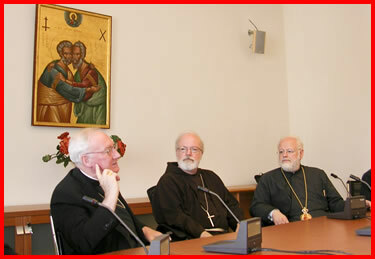 In the meantime, Metropolitan Methodios and I, joined by a representation of five Catholics and five Greek Orthodox pilgrims, met with Bishop Brian Farrell, Secretary of the Pontifical Council for Promoting Christian Unity. 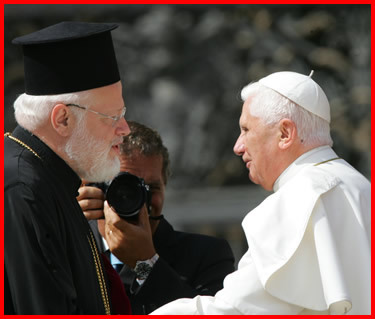 He welcomed us very warmly and was very gracious in explaining the work of his congregation, particularly in the relationships between the Orthodox and Catholics going back to the historical meetings between the Ecumenical Patriarch Athenagoras and Pope Paul VI in the mid 1960s. 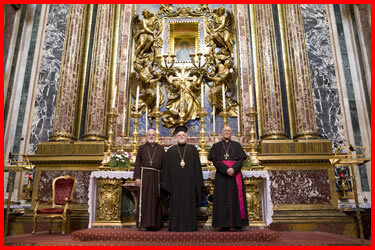 In fact, they took this picture of us in front of the icon depicting Peter and Andrew that Patriarch Athenagoras gave to Paul VI. 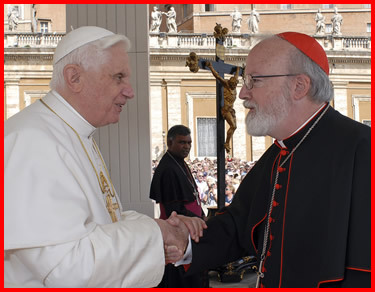 That meeting was really a sort of big turning point in the relations between Catholics and Orthodox. 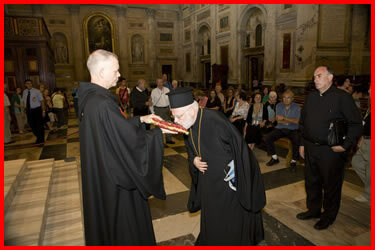 Paul VI went and visited Athenagoras. 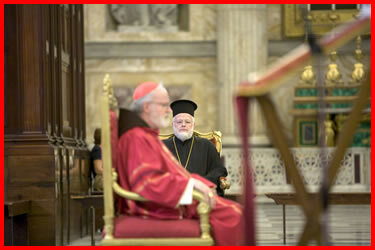 Forty years later the dialogue continues focused on the role of the papacy and the role of the synods in the Church. 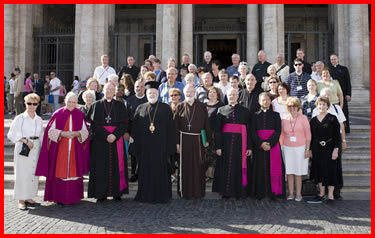 At the Pontifical Council they were all very enthused by the concept of a joint pilgrimage. Then, in the afternoon we went to my titular church, Santa Maria della Vittoria, where we were joined by Bishops Bob Hennessey and John Dooher, who are here taking a course for the newly appointed bishops here in Rome. We were also joined by Father Arthur Kennedy, the new rector at St. John’s Seminary, Father Bob Oliver, a professor at St. John’s and Msgr. 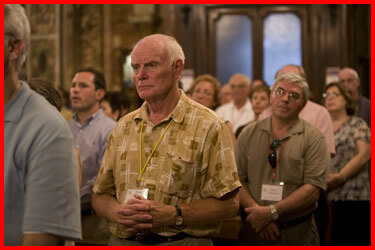 Bob Deeley, a Boston priest working at the Congregation for the Doctrine of the Faith. 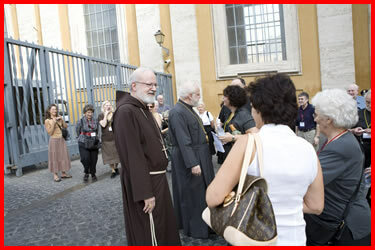 In the morning on Wednesday, we had a papal audience at which time we were able to greet Pope Benedict personally. 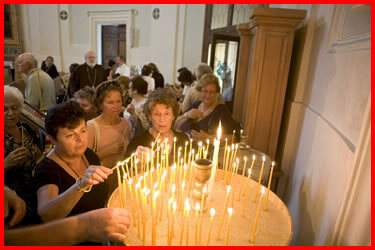 to promote unity among Catholics and Orthodox. 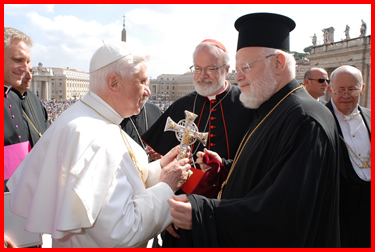 Then, Metropolitan Methodios presented the Holy Father with a beautiful silver and gold cross. 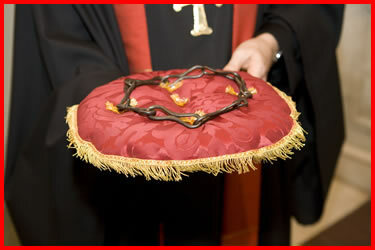 It was a hand cross that Greek bishops use to give blessings. 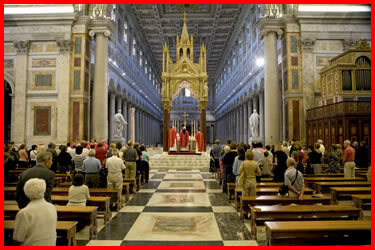 In the afternoon, we visited the Church of St. Theodore, the church John Paul II gave to the Greek Orthodox here in Rome. 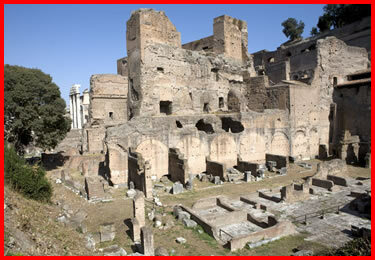 St. Theodore is right at the edge of the Roman Forum. 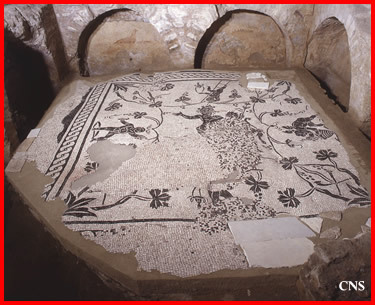 It is a magnificent, very ancient church with mosaics from the fourth century and is now a parish church for the Greek Orthodox. 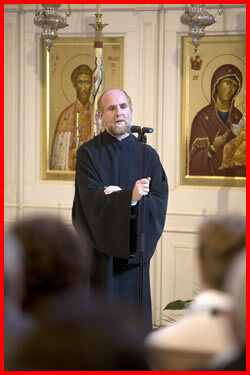 We prayed vespers there and the pastor, Archimandrite Simeon, received us very, very graciously. 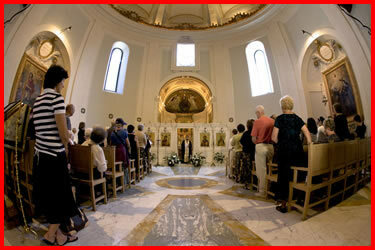 He gave us a tour and explained to us the different aspects of this lovely church. 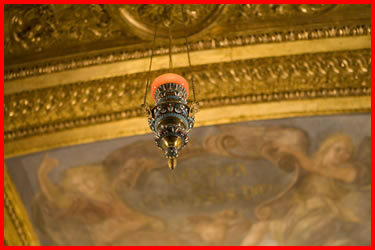 From there, we went to the Basilica of St. Mary Major. 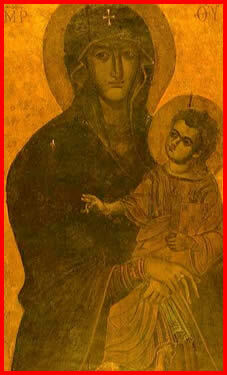 There we prayed before the icon of Our Lady that was, according to tradition, painted by St. Luke. 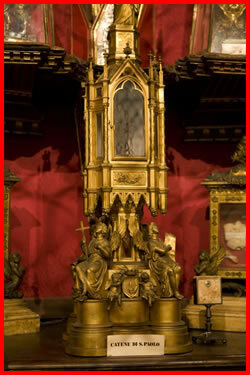 Then we also visited the major relics of the church, which are under the high altar. 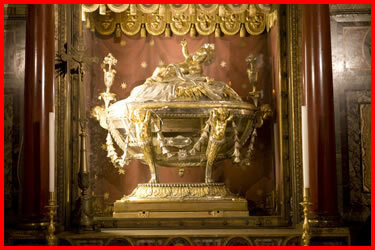 They are actually part of the crib from Bethlehem that St. Helena, the mother of the emperor Constantine, brought to Rome. 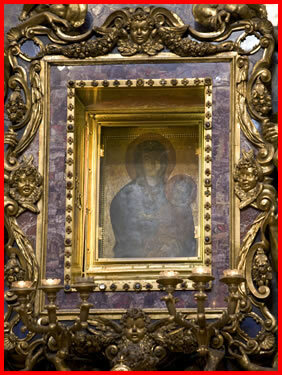 When she brought the relics of the true cross, she also brought relics of the manger, and they are venerated at St. Mary Major’s, which is the most important Marian church in Rome. 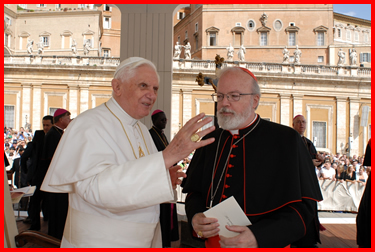 It is the church where Cardinal Bernard Law is the archpriest. Cardinal Law was not there for our visit, but he very graciously made guides available and had the bells rung when we arrived. We were made to feel very welcome by the canons of the church and given a very good explanation by Father Steven of the Heralds of the Gospel. 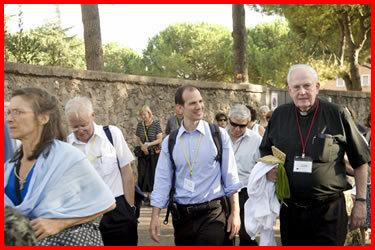 Father Steven is an American in Rome who belongs to this group, which is mostly present in Brazil and Spain. 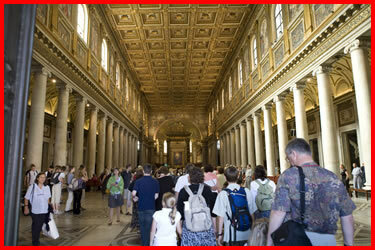 Next, we went to the Basilica of St. Paul’s Outside the Walls, and that was also an extremely moving experience. 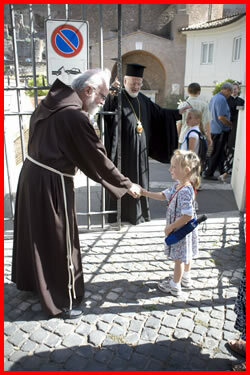 Abbot Edmund Power, who is a British monk, met us at the door, prayed over the pilgrims and sprinkled us with holy water. Then, he gave us a very long explanation of the history of the basilica, leading us at the end to the tomb where St. Paul is buried. 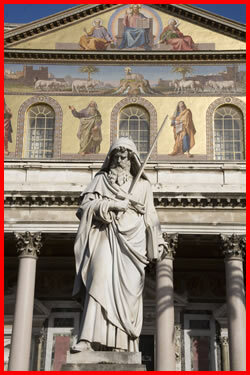 He presented us with the chains of St. Paul, and all of the pilgrims went up and kissed the chains. It was very moving. 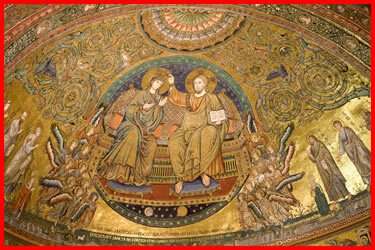 Those chains have been in the basilica from the 300s. 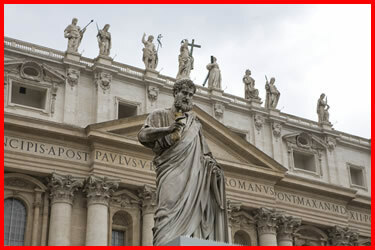 The priest said that St. John Chrysostom wrote that he wanted to go to Rome to venerate the chains of St. Paul in the basilica of St. Paul Outside the Walls. 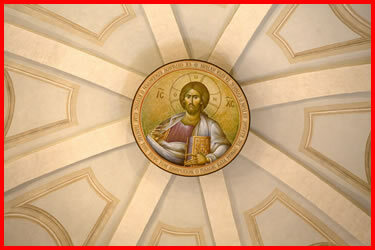 He said that John Chrysostom never made it there, but the Greek Orthodox who were there were doing just that in the name of this great father of the Eastern Church. 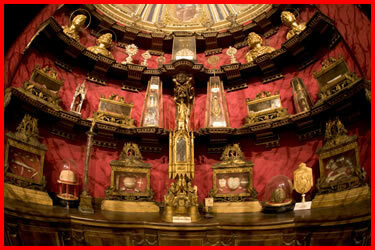 The reliquary of the chains of St. Paul. 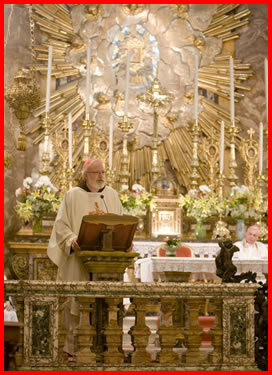 Then we had Mass and Bishop Dooher preached. We were also joined by Father Kennedy and Msgr. Deeley. On Thursday morning, we flew to Istanbul — the old Constantinople — for the second leg of the pilgrimage. 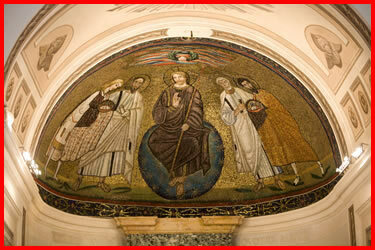 There we were expected to meet the Patriarch of Constantinople, Bartholomew I. 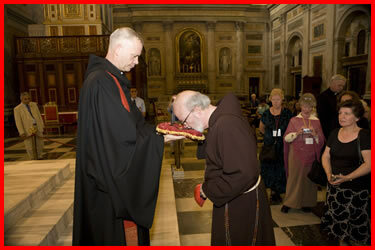 On next week’s blog I will continue my report on this wonderful pilgrimage. 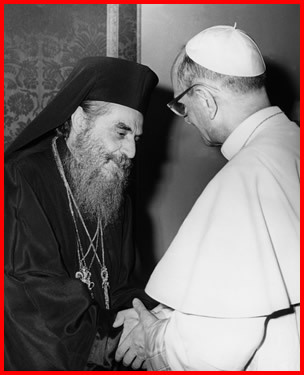 For the photo of the week I have chosen this historical photo of the first meeting between Paul VI and Orthodox Ecumenical Patriarch Athenagoras of Constantinople during the Pontiff’s 1964 trip to the Holy Land.